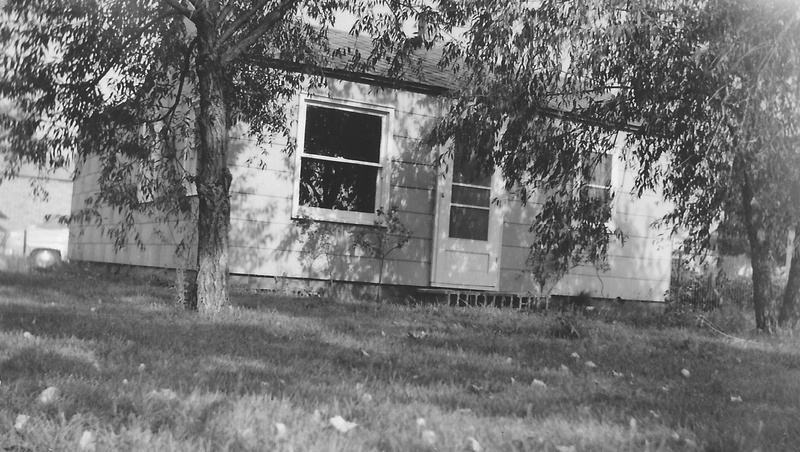 In August 1958, we moved from Anoka to Fridley into a tiny little house on NE 2nd Street. At the time the address was 5853, however, sometime during the ensuing years, the address has changed to 5881. Zillow says that the house was built in 1948 and is a 480-square-foot one bedroom home. My grandmother and my mother had the bedroom. I had the bedroom closet as my bedroom. It was a large closet for such a small house but was really small as a bedroom. As I recall, it was only inches longer than my bed. My clothes dresser blocked the side of my bed by my feet. Boxes under the bed contained most of my clothes and my boy things. I had model airplanes hanging from the ceiling. The Fridley house is the first house I lived in that is still standing. There are still houses that I lived in that were built before the Fridley House, but none of the places I lived before I lived in Fridley are still standing. 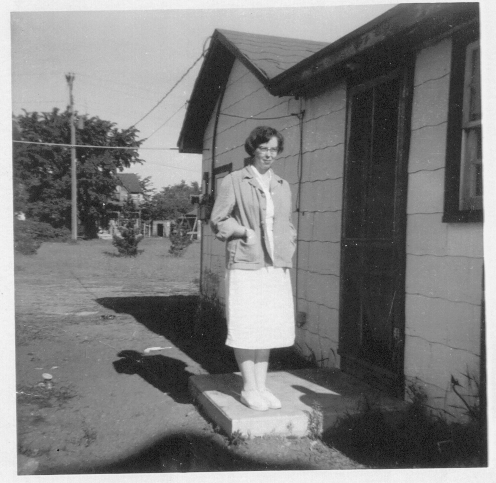 Sylvia [Larson] in nurse uniform c. 1958 – Patty Hopkin’s house in distance. My mother was still working at Anoka State Hospital when we were living there. I have a photo of her in her nurse’s uniform on the steps to the house. My grandmother’s ledger (From the Donna Darling Digital Collection) says we paid $55/month in rent. I remember life in Fridley as idyllic. A short block away was a huge open field that I played in. Later that field was where I trapped gophers (See “My First ‘Job’ – Trapper.” Down the street was “Melody Manor,” a new development. There was a park where I joined “Little League” and learned to play baseball. I was pretty much a bench warmer and only remember batting once or twice when our team was many runs ahead. My best friend was a girl, Patty Hopkins, who lived on Main street. (I wonder what ever happened to her.) Her house was across a vacant lot (now Skyline Park) to a house no longer there. A few houses down 2nd Street was where Mark and Rodney Sabo(?) lived. If I was going to get into trouble, it would be with them. There were a couple derelict houses between where we lived that were a source of fun – mostly things like knocking down hornet’s nests and yellow-jacket nests. The derelicts are long gone and a 2-1/2 story apartment is there today. Also, about a half a mile away was the Mississippi River and Chase Island. There was usually a tree down bridging the distance from shore to the island. Lots of fun playing there. Of course, I wasn’t supposed to go there to play – it was across both a busy highway (without any lights) and across multiple railroad tracks. Sometimes, I’m amazed that I lived through my youth. We lived in the Fridley house for two and a half years, by far the longest I had lived anywhere up to that point in my life. 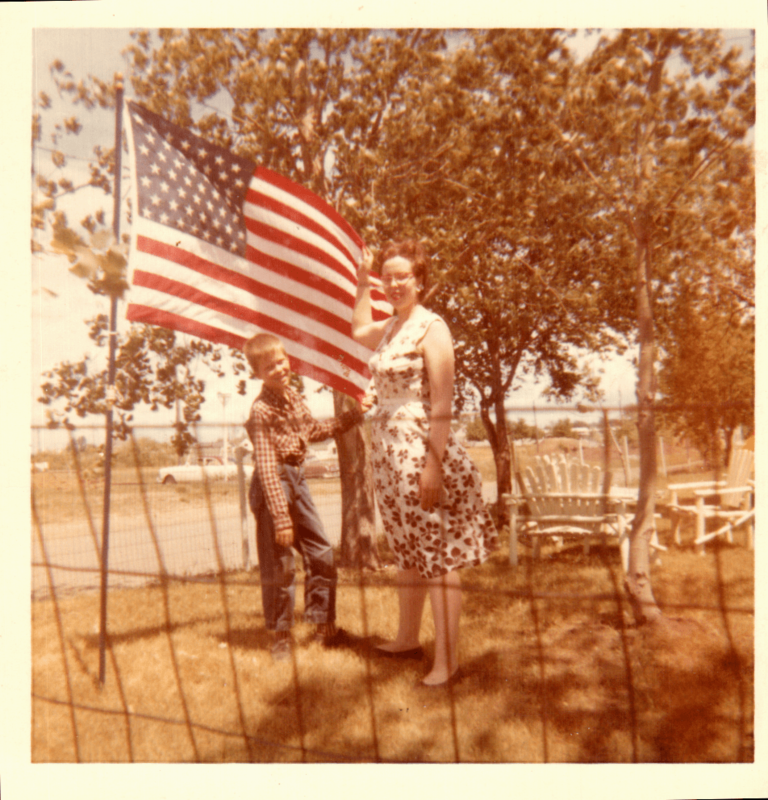 As I recall, we painted that house, fenced it, put on awnings, put up a flagpole, and did many other improvements to the house, yard, and property even though we were renters. My grandmother planted moss roses along the side by the side door – they are still one of my favorite flowers. I love how they open-up to full bloom every morning and close every night. Parkview Elementary was about six long-blocks away (nine long-blocks in a mile) and I walked. I don’t remember much about third grade. 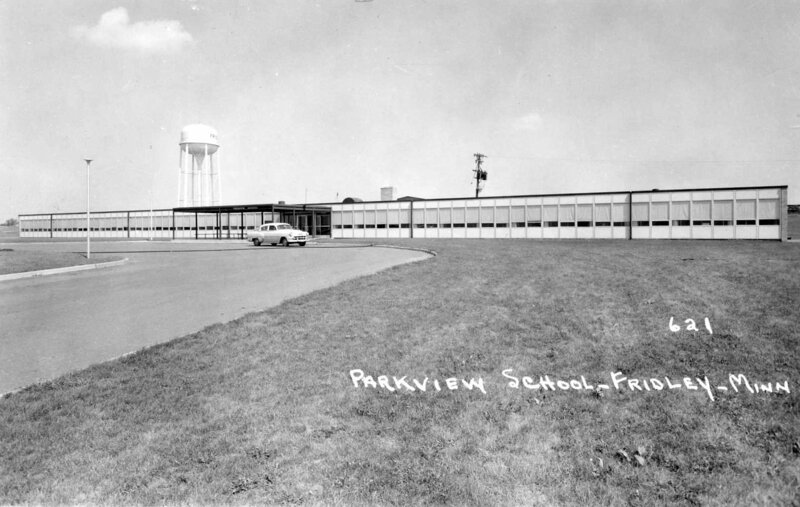 I know the school was new. In fourth grade, I had Mrs. Peterson as my teacher. She, as I recall, was older and she saw something in me that she encouraged. Fourth grade was the year I shifted from “getting by” to one of the smart kids. She became an “Ancestor of Spirit” for me that year. She helped make me the person I am, today. Maybe it was also because it was the first school I attended two years in a row. In any event, I excelled that year and carried on into the following year. I wrote about my 5th-grade memories previously. They are at Fifth Grade – Parkview & Spring Lake Park Elementary.